Eliminating the need to stuff both car keys and a mobile phone in your pockets, Nissan has partnered with electronics maker Sharp and mobile phone company NTT Docomo to create a phone that can do everything your car keys do, plus make phone calls. The gadget may not be able to help you open packages or stab muggers in the face like a traditional key can, but it can still operate your door locks and start up your engine. It does this by tapping into Nissan's Intelligent Key system which is already in place on premium models like the GT-R. We just hope they don't start charging roaming fees for driving your car outside of your normal coverage network. Press release after the jump. TOKYO (Sept. 24, 2008) — Nissan Motor Co., Ltd., NTT DOCOMO, INC. and Sharp Corporation announced today that they have jointly developed a mobile phone capable of functioning as an intelligent key for automobiles - a world's first. The device will incorporate Nissan's Intelligent Key system, already a standard feature in various Nissan vehicles. The convergence of automotive and cellular technologies was made possible by DOCOMO's expertise in the marketability of mobile phones, Sharp's development of the phone itself and Nissan's provision of technical support to ensure the key's operability with its vehicles. Nissan's Intelligent Key system, installed in more than 950,000 units of various Nissan models since 2002, employs two-way wireless communications technology to automatically unlock/lock the car door and start/stop the engine. Nissan and Sharp has now integrated these electronic intelligent-key, wireless communications and electromagnetic technologies into the new handset. As mobile phones increasingly become a daily necessity, the integration of these technologies and the potential to further expand related functionality helped to bring together the three parties, who expect users to appreciate the seamlessly integrated features of their new handset. 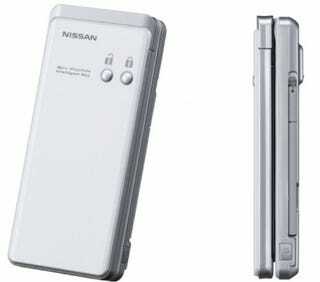 Nissan, DOCOMO and Sharp will demonstrate this mobile phone with built-in Intelligent Key in their respective exhibits at CEATEC Japan 2008, which begins September 30. The three firms will continue to develop the product with an aim for commercial distribution in early fiscal year 2009.